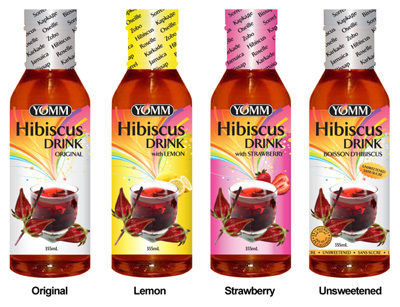 YOMM Beverages brings the great taste and the most exciting health benefits of Hibiscus Teas to you. With our variety of flavoured hibiscus flower tea drinks, loose hibiscus teas, and individually packaged hibiscus tea bags, it's easy to make sure you have a refreshing drink right at hand. Whether you like hot tea, or a cold drink, you'll enjoy YOMM. Our ready to drink formulation is available in four delicious flavours namely, strawberry, lemon, original flavour and sugar-free! 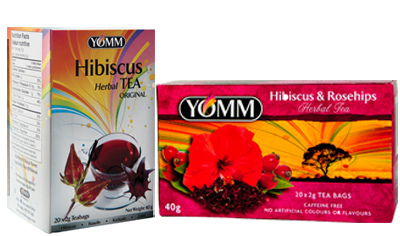 We pack 100% pure Hibiscus tea bags and also Hibiscus & Ginger, Hibiscus & Lemon, Hibiscus & Rosehips, Hibiscus & Mint. Our dried loose flowers are sold in an air tight foil bag to preserve freshness and aroma! Enjoy our ready-to drink Hibiscus Tea, made with the infusion of the Hibiscus Sabdariffa flower and sweetened with natural agave and organic cane juice. Being free of additives, preservatives and with no caffeine makes our Hibiscus Tea drinks ideal for the whole family. Choose from four delicious flavours: Original, Strawberry, Lemon and Sugar-free! With only 15 calories per 355 ml our Sugar-free formula is ideal for those diet conscious individuals. please check our product drink labels. 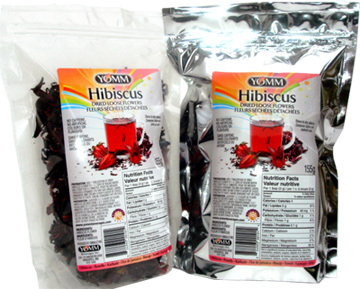 Experience pure hibiscus petals dried and batched in individual packets for your convenience. Just add hot water and you have a convenient drink when at home, in the office or on vacation. It can be consumed hot or cold. 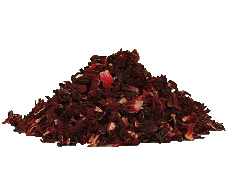 For those who like to steep their own tea, explore cooking or just like the aroma of the Hibiscus flower, we offer dried, loose flower petals. These dried petals are packed in air tight, foil bags and are sold in bulk. They are the ideal item for those who like the benefits of Hibiscus every day. Looking for a unique gift for a house warming or need to just to say "thank you" to someone? Give the Hibiscus Variety Pack. Experience all the available flavours in ready to drink teas, along with convenient tea bags that are just waiting to be dropped into hot water. This pack makes it possible to give the Gift of Good Cheer and to make others feel good.